A few weeks ago we were called by a group of grassroots activists that we work with about a young girl who had been married off to an older man. Just fourteen, they suspected that she was already pregnant. Early marriage is one of the forms of trafficking that people rarely address. However, in a place like Kenya it undoubtedly is one of the most tolerated forms of trafficking. When we went to see the girl, we found out that the case had been reported. The police did not understand the situation and took into custody both the girl and the man who had married her. The girl was detained in the police station for five days. If you have been in any police station in Kenya, you understand that a cell is not the place for a young girl, who has been a victim of abuse, to spend the night – let alone five nights. I can’t understand how the police could think that keeping her detained was a good idea. 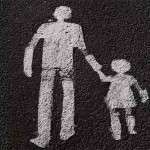 Human trafficking is one of those issues that is generally complex in nature. This is mainly because it has many cross-cutting issues and we cannot tackle the issue of trafficking without dealing with all the issues that surround it. There is no doubt that detention of children is one of those issues that we have to handle in our counter-trafficking efforts. Detention like many other issues to do with trafficking are issues that people do not know enough about. In many instances children and women who are victims of trafficking are detained by the authorities despite the fact that they are victims and need our protection. I know that the detention of refugees and children of migrants happens regularly when the police get involved. 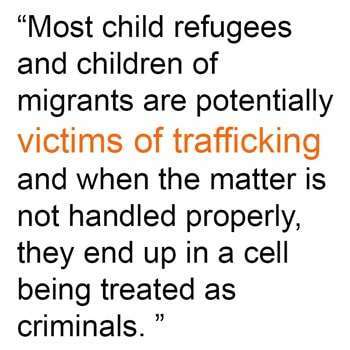 Most child refugees and children of migrants are potentially victims of trafficking and when the matter is not handled properly, they end up in a cell being treated as criminals. Handling the matter properly entails looking at them first of all as children. The law is clear about the protection of children and detention is not part of that definition. More and more victims of trafficking especially children are at risk of being detained. Kenya is considered a source, transit and destination point for victims of trafficking. Therefore, we have many cases of trafficked people passing through or coming to Kenya. 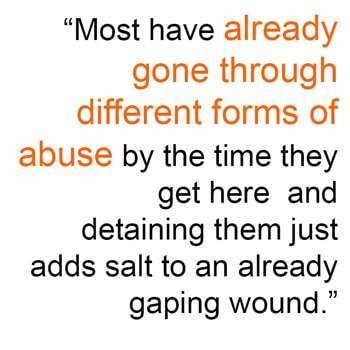 Most of the victims have already gone through different forms of abuse by the time they get here and detaining them just adds salt to an already gaping wound. The girl that we rescued was fortunate in that we were following up the case and we, and our partners, kept pressure on the police until they released her. We are seeking justice on her behalf. She is one of the fortunate ones. How many children like her are not so lucky? We will never know the answer, but there is something that we can do about it. We can advocate for the authorities to do something about detention of children. We can offer effective solutions for children that prevent the use of detention. Some of the things that we can do is construct shelters or safe houses that can be used to accommodate these children. If possible, these shelters and safe houses should be able to accommodate families in cases where we have a parent or parents with children. We can also focus on educating the police and first responders in such cases. A professional referral system that puts the needs of the victim first is extremely important. We should also advocate to hold the government accountable for respecting the dignity of every child: it is already in so many of our laws, but we do not see it in practice. 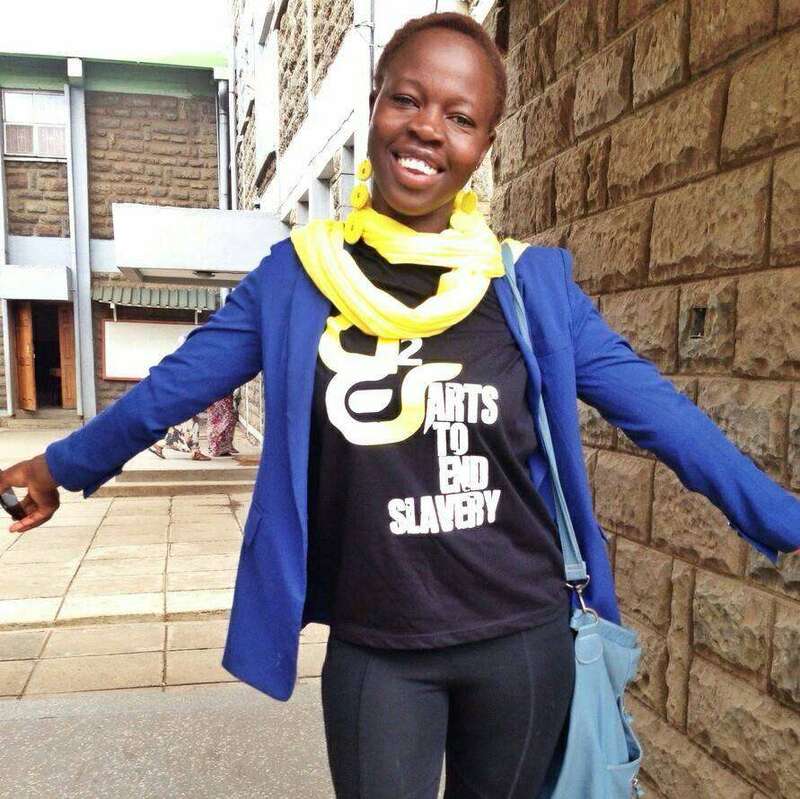 Sophie Otiende is a project consultant with Awareness Against Human Trafficking (HAART), who support the Global Campaign to End Child Detention. 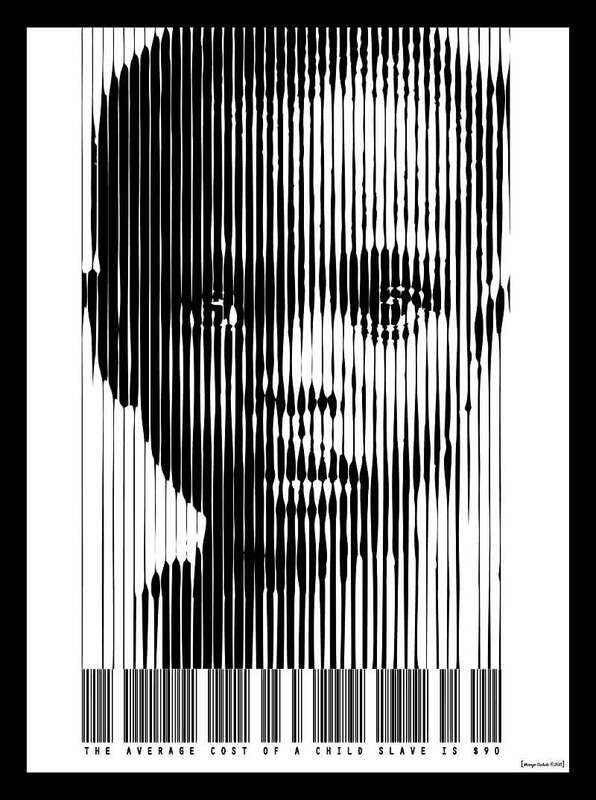 HAART is a Kenyan NGO that works to end human trafficking in Kenya mainly by creating awareness and assisting victims of trafficking. Learn more haartkenya.org. Follow us on Twitter @HAARTKenya and on Facebook at facebook.com/haart.ke and you can also read our blog on haartstories.org.